The lightness and resistance of aluminum doors make their use in new labor construction increasingly common. 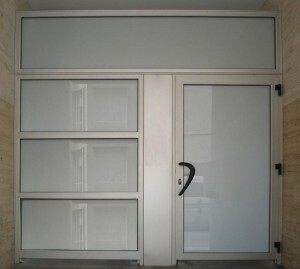 The aluminum doors are excellent acoustic and thermal insulators that prevent possible infiltrations of water or air. Click on the following links to watch images. To clean the part of aluminum of a door we advise you to simply use a damp cloth with water. As for the crystals, you can add a little window-cleaner. We recommend that once every year and a half, applying a little protective oil to the rubbers of the doors this prevents the effects of sun and air that occur with time. Whenever you see any irregularity, do not try to use any force, first consult your trusted technician.